A 26-year old striker for Cameroonian second division team Dynamo de Douala collapsed during a match and later died, according to Cameroon's professional Football league. Leopold Angong Oben was fouled in the penalty area, earning his team a spot-kick during the first half of the match against Colombe du Dja-et-Lobo at the Reunification Stadium in the commercial capital Douala on Saturday. He received treatment on the field and resumed play but collapsed minutes later. "He collapsed in the stadium in the 33rd minute of the match. "His team mates tried to revive him without success," said sports journalist Aime Moukoko, who was in the stadium reporting on the match. 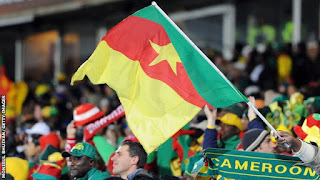 The referee called for the assistance of Red Cross personnel present at the stadium, the Cameroon Professional Football League said in a statement. "(Oben) was evacuated to a Douala hospital where he passed away minutes after," the statement said. His cause of death has not been disclosed. Oben was the second player from Dynamo de Douala to die in the span of three weeks after 27-year-old goalkeeper Ferdinand Mbog passed away following an unspecified illness.